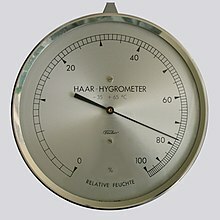 A hygrometer UK /haɪˈɡrɒmɪtə/ is an instrument uised for measurin the moistur content in the atmosphere. Humidity measurement instruments uisually rely on measurements o some ither quantity such as temperatur, pressur, mass or a mechanical or electrical chynge in a substance as moistur is absorbed. Bi calibration an calculation, these measurt quantities can lead tae a measurement o humidity. Modren electronic devices uise temperatur o condensation (the dyow pynt), or chynges in electrical capacitance or resistance tae measur humidity differences. This page wis last eeditit on 11 October 2013, at 21:43.